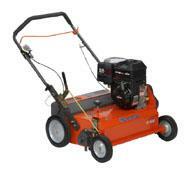 @THIS MACHINE IS ONLY DESIGNED TO CUT 1/8" (ONE-EIGHTH INCH) INTO THE DIRT AND LAY THE SEEED ON TOP OF THE GROUND. MACHINE DOES *NOT* PUT THE SEED INTO THE GROUND. MACHINE IS *NOT* "SELF-PROPELLED"
WITH 31'', HEIGHT 33"-39", LENGTH 46"